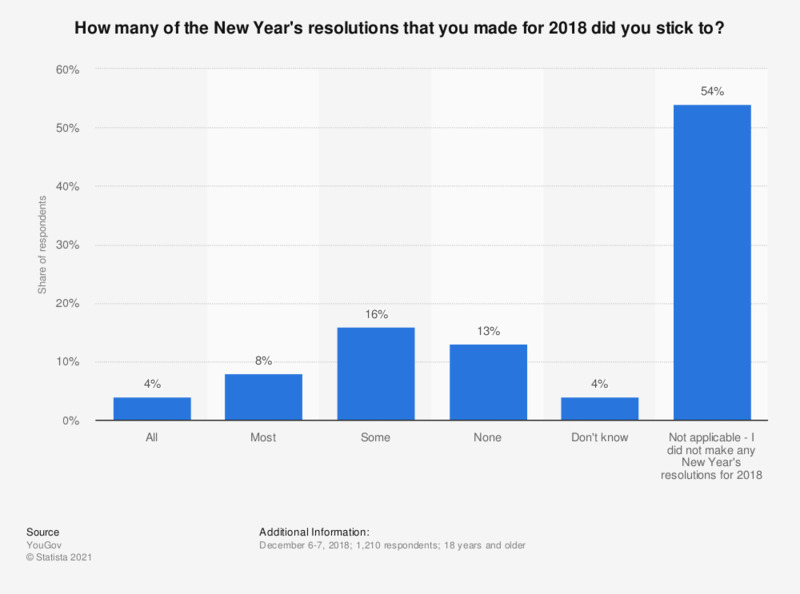 This statistic shows the results of a survey, conducted in December 2018 in the United States, on whether Americans stuck to their New Year's resolutions for 2018, or not. During the survey, 16 percent of respondents said they stuck to some of the resolutions they made for 2018, while 13 percent said they kept none. The original question was posed as follows: "How many, if any, of the New Year's resolutions that you made for 2018 did you stick to?" Do you have or plan to have a New Year's resolution for 2017? Are each of the following a New Year's resolution for 2017 of yours or not? For the following year, in which area of your life you wish for changes? Will you be making New Year's Resolutions for 2019? Will 2017 be better or worse than 2016?